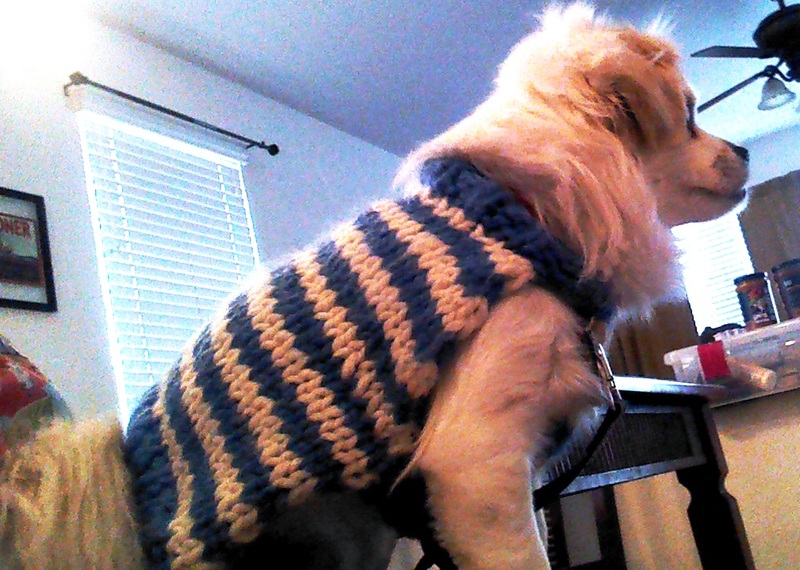 Look at this regal creature and how dapper he looks in his little striped sweater! 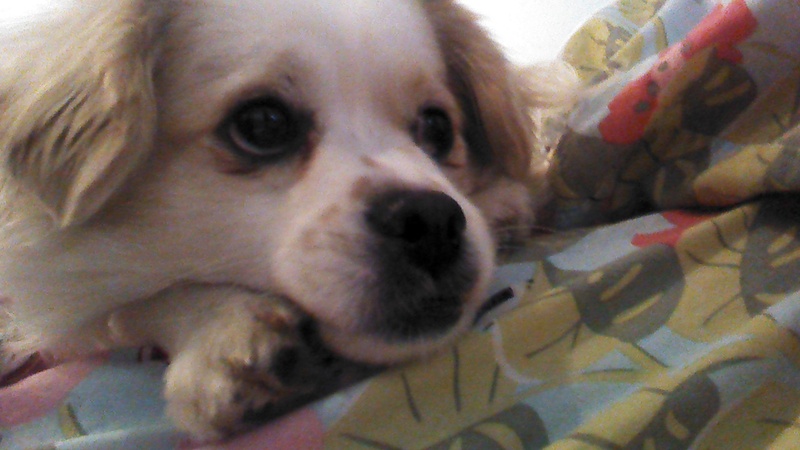 Meet Fonzy, my mom’s darling rescue! In a lot of ways, they rescued each other. To spare you from me becoming a weepy, drippy mess, I won’t go further on the whole rescue thing. Rather, let’s discuss his fun sweater. How can any one resist that mug?! 2 colors of Lion Brand Wool Ease Thick and Quick Yarn (not a lot. Less than 1/2 a skein each) OR 2 different colors of a super bulky weight yarn. Decide which one will be the main color (MC) and which will be the accent color (AC). 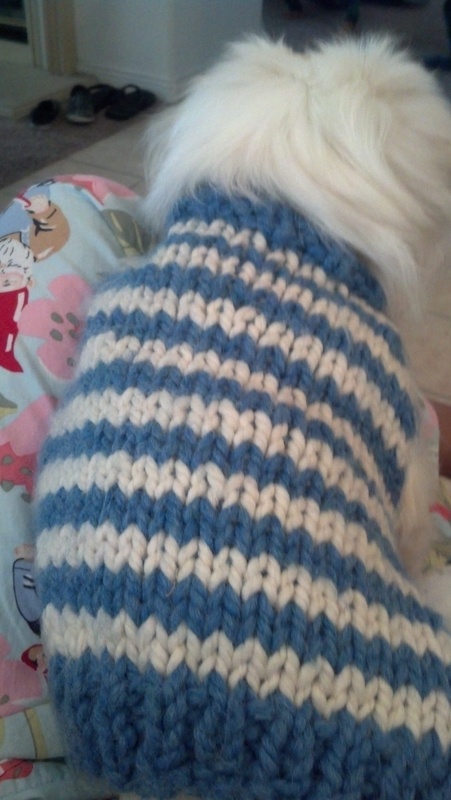 This pattern fits a smallish dog less than 15 pounds. The finished sweater will be 12-13 inches long and 18ish inches around the chest. Hint: It helps to have your model nearby to try on the sweater. If you are making it as a gift, try to find a stuffed animal roughly the same length and girth of your beloved recipient. With MC, cast on 25. Without cutting yarn, switch to AC, work stockinette. Alternate MC and AC after working one row of knit and one row of purl. Continue until the piece measures about 7 inches (or longer depending on the size of the dog). Begin decrease. On the right side, K1, k2tog, k to last 3 sts, ssk, K1 – 23 stitches. Continue the stripe pattern stockinette stitch for 3 rows while repeating the decrease every 4th row until you have 15 stitches. Begin K1, P1 ribbing for 4 rows. Bind off. With MC, work 4 rows of K1, P1 ribbing. Without cutting yarn, switch to AC and work the stripe pattern stockinette stitch until the piece is 4 inches long. Begin decrease. K1, k2tog, K to last 3 stitches, ssk, K1 – 9 stitches. Continue the stripe pattern stockinette stitch for 3 rows while repeating the decrease every 4th row until there are 5 stitches left. Switching to MC, work 4 rows of K1,P1 ribbing. Bind off. Starting from the neck edge, sew the chest piece to the back piece just until the ribbing ends. Matching the stripes up, leave a good size opening for the legs (at least 4 inches, however, I like to just sew the ribbing of the chest piece to the edges of the back piece to be absolutely sure those squirmy legs easily fit in there without too much struggle). Let’s face it, doggie sweaters are really for their humans to look at and fawn over. I don’t think they really benefit the little guys much. This entry was posted in Knitting and tagged bulky weight yarn, Christmas, dog, Fonzy, knit, knitting, lion brand wool, ribbing, stockinette, stripe, sweater. Bookmark the permalink. There are so many things I love about this post. The best? The fact that mom and fonzy rescued each other. It’s so true and awesome all at the same time. Nice sweater… Fonz loves it, too! Thank you! That naughty little turdy-burdy inspires me to make ridiculous outfits for him! That sweater is so much cuter than the stuff I buy my Pierre. I am going to have to learn how to crochet one of these days!